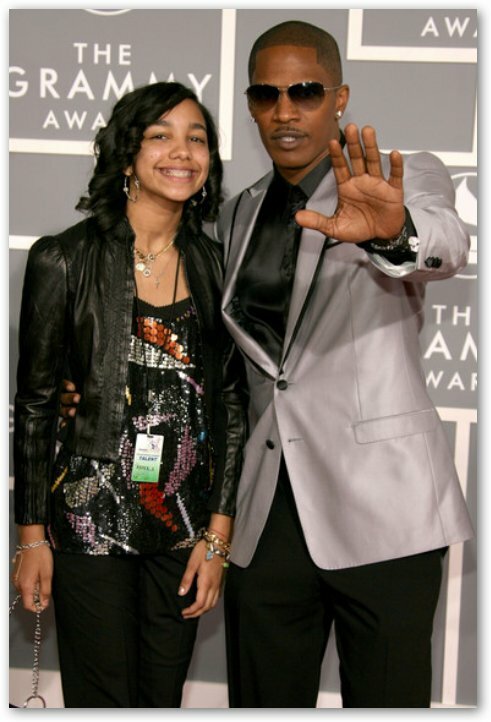 Corrine Foxx is Jamie Foxx's daughter. The 14-year-old has recently been banned from dating by her father after some mistook her for his new girlfriend. Foxx says, "I was coming out of a restaurant with her, I guess the paparazzi didn't know who she was, and the paper said, 'Foxx with young hottie.' She's so beautiful, she's five (feet), seven (inches), size nine-and-a-half shoe." Jamie Foxx concludes, "She's not going to date until she's married." Although living with her mother, Corrine Foxx is often seen with her father, attending Hollywood events. The 41-year-old actor was last seen in "The Kingdom" in 2007, but he will return next year in "The Soloist", playing homeless musician Nathaniel Ayers.